Thessaloniki is the second largest town of Greece and the most important centre of the area. Thessaloniki has some of the most beautiful beaches and has some of the finest restaurants in northern Greece. There are plenty of sights which really do raise the overall appearance of Thessaloniki namely its historical White Tower, traditional Greek architecture, and Byzantine city walls. Thessaloniki steady hosts concerts and festivals as well as conferences such as International Trade Fair. Thessaloniki University is the largest in Greece and accredited as one of the top 250 in Europe. Out of the city, you have fingers of the Halkidiki peninsula with beautiful sandy beaches endorsed by pine clad ridges. 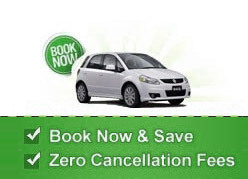 Sightseeing around Thessaloniki Airport can be made easy with a low priced car rental deal. Check our easy to book rental form given above to search for more pick up locations in Thessaloniki.